38 “Give, and it will be given to you. A good measure, pressed down, shaken together and running over, will be poured into your lap. For with the measure you use, it will be measured to you.” ~ Luke 6:38, NIV Read in Kindle Cloud Reader For Free! In the 2011 post I was more concerned in expressing the virtuous act of charity, or the end result. But today I want to focus on the process we all must undertake to become charitable as it relates to the, “first degree”, (so-to-speak), and thus what we can expect from life in accordance to undergoing the path to charity. Jesus, in the Gospel of Luke 6:38 is talking about how God measures our charity, for the word, “measure” is repeated three times, (which is of holy significance), which is a pattern constantly repeated throughout the Old Testament in accordance to the Hebrews in measuring all kinds of things including actual measurements of distance, sacrificial responsibilities within months and years. God applied such a holy significance on the number three that to truly understand the many layers and levels Jesus was applying to his words one would have to have been intimately familiar with old testament teachings and the belief system of the Hebrews that had later became the Jewish standard that Jesus was dealing with when he used the word “measure”. To help in understanding the symbolic nature of the usage of the number three a study was conducted by Richard D. Patterson, titled; “The Use Of Three In The Bible”. 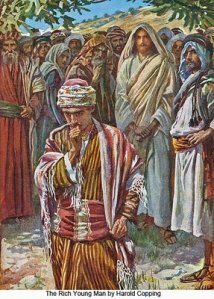 Thus, when Jesus used the word,”measure” three times then he was eluding to this deeper understanding of the process one must undergo when deciding or contemplating how to react to the poor, how to give, what the reward will actually be, and how it will be delivered. Jesus is talking about a process of how justice is to be dispensed, how we should perceive our role in this life and what we can expect from God when we give from the right perspective. So what is the right perspective? Charity again is an unnatural act, the laws of nature are such that only the strong survive, and the weak parish. Thus, the perspective of Jews doctrine and later the philosophy of Christian teaching, most certainly the delivery of Jesus as in how he spoke, the words he used, the manner he carried himself, to the miracles he performed, and then the brutal way he was killed by the Romans are in its totality contradictory to the laws of natures. His death then must have re-enforced the laws of nature in that the weak die under the foot of the mighty; but the message he gave again in contrast was also not natural, it was a hard message to grasp because it forces us to feel a plethora of emotions that make us uncomfortable with our selves, with world, with our relationships, with our careers, and with God. But it is through the pain of change do we begin to contemplate a different path, one absent of brutality, one more forgiving and tolerant, one more kind and filled with the of love of God. 1 “Blessed is he that considereth the poor: the Lord will deliver him in time of trouble. 2 The Lord will preserve him, and keep him alive; and he shall be blessed upon the earth: and thou wilt not deliver him unto the will of his enemies.” Psalm 41:1-2, NIV Read in Kindle Cloud Reader For Free! Notice the act of Charity first must come from a place of pain, which then begins to change us, and within that change transforms our perception of the world we live in. All this is sparked from an action that forces us to think, to consider, to contemplate a different reality than what nature has thus far provided. In this alternate reality then, Jesus proposes for us to walk in his likeness. God Himself commanded us to treat each other in a more peaceable manner. Indeed the process God has placed humanity is a three step process which is derived of love, resulting in charity. Think about how different the world would be if we did not harbor ill will for our enemies, how different would life be if everyone was charitable to each other, freely giving to each other what we need, helping those who have less than. For in contemplating that reality today was met by the same resistance with equal force of the message Jesus taught two thousand years ago. As race, we are collectively being taught that nature does not have to be as harsh as we first perceived it to be. We can be kind, loving, and charitable with one another just as Jesus had first commanded. In retrospect its just one more step to being molded into a better version of ourselves, one closer to God, closer to righteousness. We are truly blessed in our contemplation about how to best respond to the poor. The Lord does deliver those who first have the spark of charity in their heart. I had told one of my students many years ago in response to a question about why we need to give to those “strangers” on the street begging for food, “that to see and do nothing is just as wrong as doing something for the wrong reasons. We are convicted with the same measure we judge others with. We will receive in the same measure we give.” In that through the process of thinking, we place ourselves in the other persons shoes, we begin to think and to feel what it is like to go without, the pain of not having, and thus through that process do we come to the realization of what the right course of action should undoubtedly be. Because if we submit ourselves to the out dated laws of nature, that “stranger” would be stamped out without remorse, without any thought, and the human being that his soul represents would be smitted for all time. So yes, the Lord does preserve him, and keep him alive through the charity of others who can sympathize and rationalize the harshness of his reality. 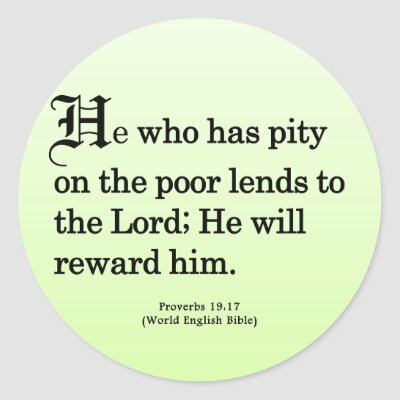 17 “He that hath pity upon the poor lendeth unto the Lord; and that which he hath given will he pay him again.” ~ Proverbs 19:17, KJV Read in Kindle Cloud Reader For Free! 17 “Whoever is kind to the poor lends to the Lord, and he will reward them for what they have done.” ~ Proverbs 19:17, NIV Read in Kindle Cloud Reader For Free! Over time the way we think about scripture reveals how we as a people have changed in our relationship with God. We tend to stop fearing God and this leads us to change harsher words found in scripture with ones less harsh, less intrusive, less invasive, less critical, less judging, and less demanding stripping away all since of obligation to our fellow man as depicted here with the usurping of the word “pity” with “kind”. I argue we must feel “pity” for those in our lives closed to charity, for those who are poorer, we must feel this emotion of “pity” first before our contemplations of what to do about this obvious need that surounds us daily can fully manifest itself into our hearts and minds, before we can truly be “kind”. It is Gods way of molding us into a better person, moving us into action in ways we never thought possible. It is His action of inducing discomfort that shapes our sensibilities and gives us a new path with new values that allow us to be charitable, because in stark reflection of mankind we are not naturally charitable nor naturally kind. It is this which separates us from all other creatures in creation, it is this ability that makes us redeemable before God, and thus led God to send his only son in the greatest act of charity known to all creation. So it is those harsher perspectives of ages past that is closer to the real message of God, it is the meaning behind the word “pity” that tells a different story about what is required to become charitable, and the action as depicted in the word “kind” that is a completely different path from hence we have started and which leads to a different conclusion within our hearts and minds. Therefore, we must first feel the emotion of pity before we can allow ourselves to mature enough in the spirit to take action and to be kind, and through that process we are in the spirit and truly being blessed because we have acted upon a volume of preset emotional triggers God had put into place that moved and molded us into the act of charity. Thus, both versions of Proverbs are necessary to understand within the right context as it relates to the true definition of charity and the process we must first go through. 13 “But when you give a banquet, invite the poor, the crippled, the lame, the blind, 14 and you will be blessed. Although they cannot repay you, you will be repaid at the resurrection of the righteous.” ~ Luke 14:13-14, NIV Read in Kindle Cloud Reader For Free! See our Lord meant every word he uttered. I like to believe that he underwent a long dress rehearsal before being born to Mary and Joseph. I think Jesus knew instinctively what to say and how to say that would make people resist His radical concepts. For Jesus not just preached His message He lived His message. Thus, because we are also called to live in like manner to Jesus as humanely possible I would love to see our President hold a huge dinner with an un-godly amount of food, then fly people from all over the United Stats, and Africa, Asia, and Mexico to take part in this feast. Because that is what Jesus would do. I say that because we are the wealthiest nation with the most plentiful of resources and yet we have such poverty, some of us live in the most impoverished of situations. Likewise, no matter how bad off some of us Americans have it there are people from all over the world who have it ten times more harsh, more impoverished. I say to you, that would be a righteous response, that would be an awesome act of charitable giving ever on behalf of our richest sector of our population. But in saying this, how many of those in our upper class would be tempted to charge these poor people something for attending? Again this reimbursement mentality is not just in our upper class but permeates throughout all classes of our society, it reaches down and destroys family, forcing many of us parents into poverty even though we work. We are being forced into slavery by paying double what any other person would only be required to pay once. Indeed our nation is sick, as is most of the worlds population, and it is that reality many people do not want to hear. So they change the wording of scripture, distance themselves from God, so there isn’t this big perception of obligation, and so we can live comfortable lives being charitable on our own terms, not on Gods terms. To this I can only say, How much more blessed would we all be if we just gave into to Christ, Jesus, and submitted to His perfect ideal of charity. 33 “Sell your possessions and give to the poor. Provide purses for yourselves that will not wear out, a treasure in heaven that will never fail, where no thief comes near and no moth destroys.” ~ Luke 12:33, NIV Read in Kindle Cloud Reader For Free! The concept of selling everything was also a teaching that the people of Jesus’s time just completely resisted. In that time as like to this time people were and are very materialistic judging wealth by what you own, not by how much you have given to others. Think about the standard we for thousands of years have lived by, accumulate stuff, call it yours, show it off, brag about what you have taken from others, and then at your death your family becomes vultures and pick your estate apart as if you had never lived. No put that into contrast to what Jesus required, sell your possess, create treasures in heaven that cannot be stolen or that does not rust. Give to the poor in this life so your next life will be bless with a permanent abundance. The obvious problem is greed, we are as we were a “Now Society” we are a “ME” orientated race, thick headed people. Personally I don’t want the unhappiness of being extremely wealthy, but I do want to have enough to share with all those I love and those who need me to share with them. I would like to build a permeant source of income that could be used to help millions rather than one or two lucky enough to be int he right place at the right time. That too isn’t how God works. In general societies work best when everyone shares resources, no one is above the law, no one has more or less than the other. The closer to that ideal we can get the better we all will be. 21 “It is a sin to despise one’s neighbor, but blessed is the one who is kind to the needy.” ~ Proverbs 14:21, NIV Read in Kindle Cloud Reader For Free! Again we see this hard to grasp ideology of living without greed. Charity by its very nature is the exact opposite of greed, and thus the more greedy you are the less likely you are to be able to accept the whole notion of being charitable, and when the opportunities in life arise where by God is testing you to be charitable then the less like you are to passing this test. Sadly I have seen many people fail this test of Gods, and it had nothing to do with money, or possessions, but everything to do with attitude and disposition. I have bared witness to people that I deeply loved fall into this mindset of oneness, singular thinking which dictates there can only be one path, one person, one important set of philosophy and belief. Normally these people fall into depression because they locked out hope, love, caring, compassion, forgiveness, and year they by nature are not charitable even when it would be within their best interest, they cling to a desperate ideology of greed, mired in full blown selfishness. Again the exact opposite of greed is charity. In this life you can expect to be given many chances to be charitable, you will confronted by hundreds if not thousands of people asking you, pulling at you, begging you to show them charity, but in faith know that God is the judge of all you do and he alone knows your heart. He alone knows if you truly where contemplating or not about an act of charity. God alone knows your mind and in some regards is rooting for you, encouraging you to scatter gifts in every direction, giving to the poor, not just in your monetary wealth but also in your time, in your heart. True charity is born from that uncomfortable feeling of pity, then guilt, which moves you to contemplation and action. 13 “And now these three remain: faith, hope and love. But the greatest of these is love.” ~ 1 Corinthians 13:13, NIV Read in Kindle Cloud Reader For Free! Faith in God is equal to your heart trusting in His path, accepting His ideal which is uncomfortable in many terms, but this faith you build within God gives you hope, and in turn this hope builds up in you a love of charity. A deep longing to always be a helper to others as God is a helper unto you. If you liked this Reflection on CHARITY please leave a comment. Also please LIKE and SHARE this post with others. In the spirit of charity and from the necessity to provide for all of Gods children, together in this mission, Listening Faithfully has teamed up with a wonderful charitable organization in East Texas whose name reflects their good works, “God’s Hand Ups” and their work is accomplished by a Godly motivation to help every children throughout their community. I am honored to have them as good friends in the Lord. I can testify before you all today, that my good friend who is a founding member of this charitable group has truly been tested in the manner described here in this blog posting and who has consistently passed this test of giving and working for the benefit of all in her community. I introduce you all to Tonia Allen, who currently has a wonderful new campaign in raising money for children in need. Please visit her donation site: “GOD’S HAND UPS NOT HAND OUTS ” and please be very charitable. “Someone once told me that compassion was not simple. They believed compassion was huge. Compassion is SO simple as it is an act of kindness from one to another. It is only huge when it becomes over thought. God’s Hand Ups was founded by the vision of a 17 year old junior in high school who believed the world could be saved–“one person at a time.” ~ Tonia Allen, Gods Hands Up, 2013. ANNOUNCING LISTENING FAITHFULLY ORIGINAL BOOKS! Taken from the most successful and popular series of postings on Listening Faithfully Blog in 2009-10, then edited and repackaged for your reading enjoyment, Brian has put together a comprehensive chronicle of sin! With a massive amount of research and based upon Biblical Scripture each chapter reveals the shocking and revolutionary message of our Lord, while describing how each type of sin can destroy your life if left unchecked. It is a must read for-everyone to avoid the penalty of spiritual death. Now available in the Listening Faithfully Store powered by Amazon.com! Start reading the Sin Series today in under a minute!